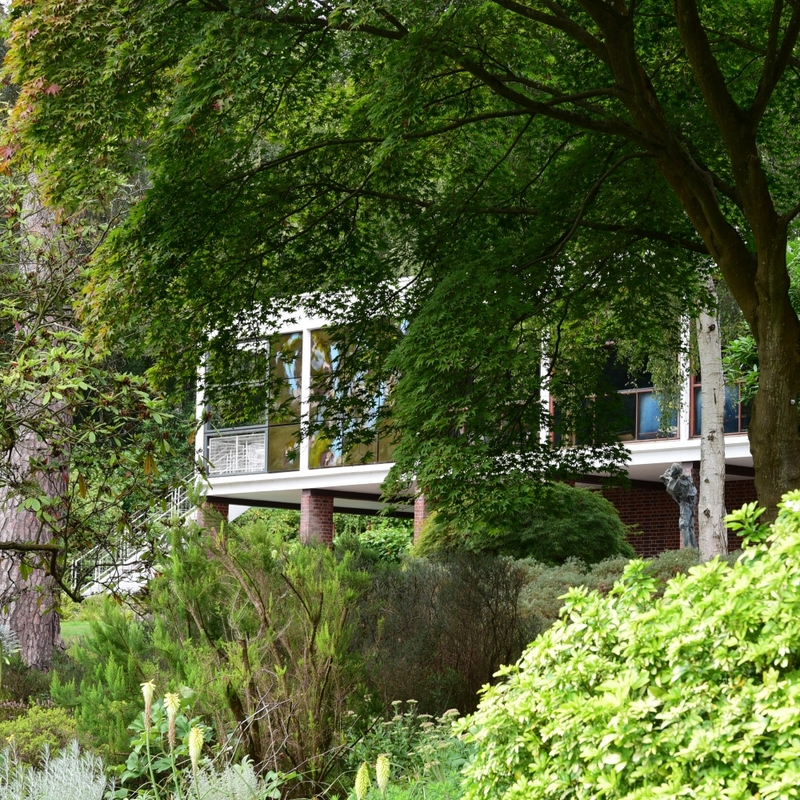 The Homewood is a modernist house by the architect Patrick Gwynne. He was just 23 when he designed the house for his parents in 1938. Luckily for him they already owned a Victorian villa on the 10 acre estate just outside Esher in Surrey. In another stroke of luck, his parents were able to sell a small town in Wales to pay for it. As anyone who's ever house-hunted in Surrey knows that's what it takes to secure a small bit of real estate here, then and now. The Victorian villa was demolished and the new house located to make the most of the views of the garden, and views of the house from the garden. Patrick Gwynne lived here most of his life and left the house to the National Trust. Gwynne made some updates to the house throughout his life but kept fairly true to his original vision. In the garden, this terrace was added in the 1970s, not an era particularly respected for its contribution to garden design (maybe concrete paving will make a comeback...?). The angular swimming pool is a success though, and is still in use by the current tenants. The water is crystal clear, illuminating the green tiles. The later addition of a curvilinear pond with bright blue tiles doesn't work as well. Just glimpsed from the house is a series of ponds. 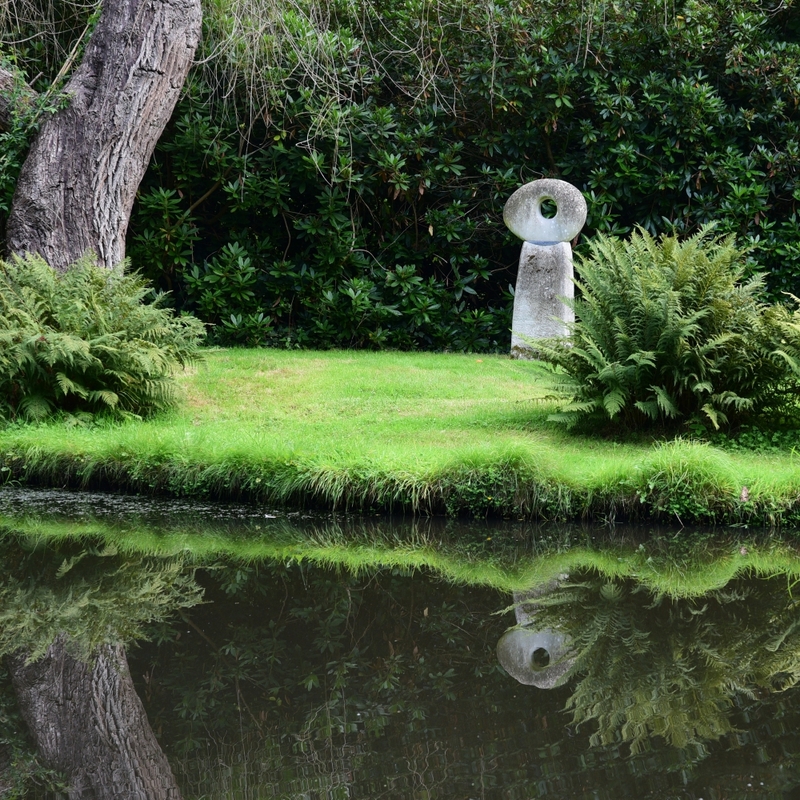 Gwynne was able to dam a tributary of the River Mole to create these reflecting pools and a bog garden. The garden guide pointed out that a condition of National Trust ownership is that every garden should have a Gunnera manicata. I'm inclined to believe he wasn't joking. Following the construction of the house some editing of the garden was carried out, with a few trees being removed or having their lower limbs pruned, to improve the views. Some of the tree stumps are used as sculptural pieces in the garden. This part of Surrey is known for its sandy, acidic soil and this is reflected in the planting - lots of heather, pines, Japanese maples and silver birch trees. It was Gwynne's aim to blur the boundaries between the garden and the relative wilderness of neighbouring Esher Common. Gwynne's ashes are scattered in this part of the garden. To see the garden you have to book a house tour. The house is only open to visitors one day a week for a few months a year so you need to be organised. A short garden tour is also on offer after the house tour. Be warned though, if you are booked on the last house tour of the day there is not much time to see the garden properly. I was hoping to sneak round the back of the ponds get to get a photograph of the house reflected in the water but was chased down by the guide and asked to leave - this was disappointing to put it mildly. The house was really interesting and fans of mid-century modernism would not be disappointed. The garden was much better than I expected so it was shame not to be able to spend more time in it. It would be good visit in spring when the Rhododendrons are in flower, or in October when the heather is in flower and the Japanese maples are changing colour. There are no facilities (tea, cake or loos) here but Claremont is nearby and the cream tea is excellent (thankyou Desna).